Opening last weekend at the Art Gallery of Ontario and running until January 20th, “Frida and Diego: Passion, Politics, and Painting” is a strong exhibition of the varied work of Mexican art icons Frida Kahlo and Diego Rivera. But, like so many other blockbuster exhibitions, it’s also a clear demonstration of how popular iconography, artist biography and commonly-circulated narrative tropes are employed in marketing and presenting fine art to the mass public. Kahlo and Rivera were long-time spouses and lovers as well as fellow artists and sometimes collaborators, sharing intense personal interactions as well as deeply-committed socialist political principles (both were Marxists and Communist Party members, and hosted the exiled Soviet leader Leon Trotsky at their home when he arrived in Mexico near the end of his life). They were also both prominent artistic figures in their lifetimes, and though Rivera was more widely-appreciated and commissioned earlier than his younger partner, Frida Kahlo has surpassed him in the popular imagination since then, not only in her native Mexico but also in anglophone America. Some of this is down to her art, with its vivid directness, flattened surrealism, and frequent incorporation of self-portraiture. 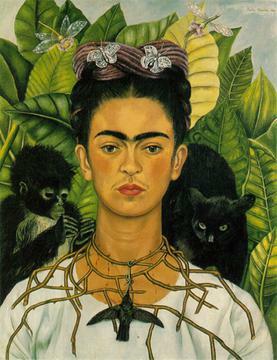 Although the more traditionally-trained Rivera covered a wider variety of artistic genres and styles, from early experiments with Cubism in his youth in Europe to his famed Mexican mural art, and was perhaps more technically impressive, Kahlo was a figure more in touch with the shapings of modern tastes and mass image-making of her time and, even more so, our own. If there is no single Frida Kahlo painting that is as iconic as the defining masterpieces of the sort that received the Private Life of a Masterpiece treatment, it may be because Kahlo was her own greatest work of iconography. In placing her own image, with her flower head-dressings, indigenous Mexican robes, and famous unibrow, at the centre of so many of her paintings as well as of the many photographs she posed for, Frida’s own constructed image defined her in the public eye. It certainly didn’t hurt, a decade back, to have an Oscar-nominated biopic starring another Mexican icon, Salma Hayek, spread that image to a wider audience than the gallery-bound art world would allow. Whatever can be said comparatively about their art, the droopy-faced, corpulent Diego Rivera could not hope to compete with his lover in the sphere of mass image marketing. But Frida Kahlo has also been the posthumous beneficiary of a biographic narrative (which sometimes become bio-graphic, when expressed in her work) that conforms nicely to the popular imagination of great art as the direct expression of pain, tragedy, and even madness. Just as Vincent Van Gogh has become the definitive representation of artistic brilliance more for his mental disquiet, self-mutilation, and eventual suicide than for his memorable (but not unsurpassed) paintings, Kahlo’s addressing of her physical pain (she had polio as a child and fell victim to a debilitating traffic accident as a young adult) in her work aligned her with the popular idea of the great artist as a channeller of personal affliction. Imagination, training, technique, and hard work (all of which her partner Rivera possessed in spades) matter less in the creation of notable art than having had harsh things happen to you, in this conception. That she and Rivera had a sometimes turbulent relationship (both had numerous affairs, for Kahlo with both men and women, and their marriage was ended for a year at the end of 1930s) and that she crossed path with historical figures like Trotsky make her even finer fodder for popular interest. But it is in her alignment with the modern individualist ideal of the artist as a conduit of personal, physical, and/or psychological anguish, as well as her exquisite self-presentation as a living icon through fashion, photography, and art, that has made Frida Kahlo the memorable figure in the art world that she remains to this day. And this, therefore makes her and her work suitable material for a major museum exhibition in the 21st Century.